At the far right of the image above, a corner of a postcard is just visible, showing a bit of stone floor. Not just any stone floor, though: the floor of the Lady Chapel at Minster Abbey. I’d never heard of ‘thin places’ before the first time I went to Minster, but it is thin all over, and the Lady Chapel particularly so. I always knew I would appreciate Benedictine spirituality. Before I had ever visited a monastery, I thought one day I would want to be an oblate. (Still hasn’t happened yet.) Nothing I imagined even came close to the reality of being there. The train journey from my home in the north of England takes about 5 hours and involves at least 2 changes, one of which happens in London (between Kings Cross and St Pancras). So when I arrived in Minster the first time, I felt like I was a long way from home (especially because the journey took a couple of extra finding-my-way hours). And so I was: a long way from anything I had ever experienced before. 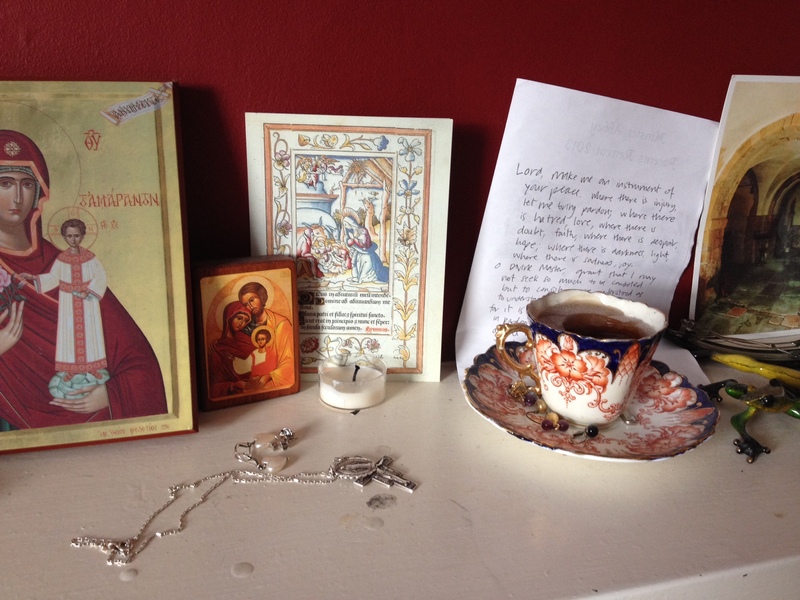 The daily office–the rhythm of Benedictine prayer–was new to me. Nuns were new to me. Yet somehow the place felt like home almost immediately. Because I was on an individual retreat, I had no schedule other than the appointed times for prayer, and no ‘input’ apart from the daily office and Mass. In my little room, there was a Bible and a small copy of the Rule of Benedict. Little did I know that reading Benedict’s Rule would change my life as much as anything ever has. That weekend, I was a woman adrift, looking for a spiritual beacon. That little book–hardly more than a pamphlet–convinced me that the spiritual life was for me. Not that I really doubted; it’s just that I had wondered since college whether I would ever recover the sense of purpose that I had as a member of an evangelical (and I mean that in the telling-people-about-Jesus sense, not the Christian brand-name sense) community. Being a mother of (then) three children and holding down a job as a lecturer didn’t leave much time for the intensive Bible study or hour-long quiet times I’d had all those years ago. But that was when it all seemed so vibrant and essential. Benedict’s Rule is for monastic communities, true. But it is about how daily life is spiritual, and how to live it in a way that makes each seemingly insignificant task an act of Christian discipleship. That weekend, I learned a Latin phrase: ‘fratres non contristet.’ It comes from the instructions to the cellarer. If a brother comes to you with an unreasonable request, Benedict counsels, refuse him gently, so as not to upset (contristet) the brethren (fratres). Being a mother involves refusing countless unreasonable demands on a daily basis, at least in my house. The challenge was, and is, to make every response–yes, no, or maybe–an act of love. That is what Benedict taught me that weekend: fratres non contristet. Every time I go into the Lady Chapel at Minster, I recommit myself to the goal of gentleness in daily life. Even with those words in large letters on my refrigerator, I forget. I forget that discipleship happens in the little things, as we do them with love. I forget that Jesus taught us more on the cross than in all the words he said. I love that saying floating around the internet at the moment: ‘if you have to chose between being right and being kind, be kind.’ Indeed. That is, to me, what gentleness is all about. But it is a lot harder than it seems! So back to the monastery I go, to find myself again in the Lady Chapel, to be in peace and grace and regulated quiet long enough to accept the fact that I have to begin again. The 22nd of January (in the US) and that Sunday in October designated ‘pro-life’ (ditto) always get under my skin a bit. Why? My suspicion is that beneath my frustration and anger, there is a point about Christian faith and practice. Too often, Christianity is reduced to a program or an issue. The checklist of what to do and what to believe is a lot easier than the command of Jesus to be perfect, or the command to love God completely, and your neighbour as yourself. It is easier, that is, to slap a pro-life sticker on your bumper, participate in the relevant activities every January (and October), and think that you are pro-life. But being for life, if it is to be a true expression of Catholic faith, must involve a whole lot more than that. It goes without saying that abortion is a tragedy in every case, and more often than not, an avoidable tragedy. Abortion is not, however, the sum of all evil. It is rather, a symptom of the corruption of our hearts–all of our hearts–and of a world in which scarcity and death threaten us. I wonder sometimes whether the energy expended to protect the unborn is really an effort to protect ourselves. Babies are loveable; it is not difficult to evoke sympathy for the children who are threatened by the practice of abortion. it is hard to imagine a person in our culture (or any culture, really) who wouldn’t mourn at the suffering of an infant, wouldn’t extend him- or herself on that child’s behalf. And so it should be. I wonder, though, whether that isn’t like loving those who love you. The point there seems to be that loving those who love you is not terribly difficult. There is a reciprocity that makes the love you give less costly. What does it cost you to love those who love you? What does it cost you to be concerned for the unborn? Time, perhaps, and prayer–and that isn’t a bad thing. But if the heart of Christian love is forgiveness (see Matthew 18 and John 20: 22-23, e.g. ), how can protesting abortion take center stage? What it boils down to, for me, is this: (1) I firmly believe abortion is wrong. (2) At the same time, I view the law legalising abortion in a similar light to the law permitting divorce; Jesus qualified that law as having been given because of our ‘hardness of heart’–though I appreciate the differences between the two. (3) I look around the world and see sin and need and lack of love everywhere. There are children who live in conditions of abject poverty and desperate need–of material goods and also of the love and affirmation they need to grow up healthy and strong. (4) I see plenty of grown-ups with the same sorts of needs. (5) I am concerned that focusing so narrowly on one evil–abortion–allows us to avoid evils more difficult to confront, and commands more difficult to obey. ‘Love your enemies…’; ‘forgive…seventy times seven’; ‘feed my sheep’; ‘make disciples…’; ‘love the Lord your God with all your heart, mind and strength, and your neighbour as yourself.’ Obeying these commands requires us to be pro-life until it hurts us, to extend ourselves for life, to confess our faith in the Giver of Life in all that we think, say, and do. We have to be conscious of the darkness and sin in our own hearts that prevents us from being the bearers of God’s light and life to others. We have to oppose practices that threaten, demean, or undermine life–like torture, slavery, the death penalty, the drug trade. We have to resist hatred, fear, indifference, unforgiveness and the temptation to leave undone the good we can do. We have to put on love and humility, letting our pride and self-sufficiency be crucified with Christ. Being pro-life is being for Jesus–the Way, the Truth, and the Life–always and consistently. To follow Jesus, to be his disciples, and to be about the business of making disciples, that is what it means to be pro-life. Praying with others for the unborn is good; mourning the loss of those children who never will be because of abortion is good; protesting a practice that allows us to exercise heartless power over the most vulnerable is right and proper. But if we stop there, we cannot call ourselves pro-life. Unless we get up on the morning of January 23rd ready to reach out to the poor, the unwanted, the unloved, the seemingly unlovable and unforgivable, unless we take seriously the call to be witnesses and make disciples, we have missed the point. Jesus came that we might have life abundantly, and to follow him means bearing that life and giving it away every day of every year, in all that we say and do. So I get angry when the topic of abortion is the litmus test for Christian faithfulness. Of course we ought to oppose abortion–but that isn’t the cutting edge of our faith. If we are growing into the likeness of Christ, we have to have bigger hearts and a broader vision. Jesus was not speaking about ‘the issues’; he was declaring ‘the kingdom of God is at hand’. Jesus came bearing love, and forgiveness, and grace, and life, and he was and is the light that shines in the darkness–and our hope is and will ever be that the darkness cannot overcome Him. Today’s reflection is another from the manuscript of my Lenten devotional. It hasn’t been the best of all possible Saturdays, with little time away from the noise and commotion. So it was good to read these words again, and remember that God is faithful, even when we falter. A funny thing happened after the 97th time (or something like that) I read Deuteronomy 30. It is the first reading for Mass today. The Mass readings are at Universalis, and my reflections are at thinking coram Deo. My instinct, though, isn’t to refrain from using the language. Maybe, even, I should start considering myself ‘blessed’ a whole lot more. Pope Francis has been talking us through the the epistle of St James recently, in daily homilies and weekly audiences. James begins (following his greetings) rather disconcertingly, ‘Consider it all joy…when you encounter various trials.’ Trials and tribulations are to be welcomed, because the fruit of endurance is to ‘be perfect and complete, lacking nothing.’ That’s blessed–and here I am in complete agreement with the accidental missionary: the good stuff is not what makes us good. It’s not even evidence that we are on the right track. That’s not, of course, to say that only tribulations are blessings: this morning’s invitatory Psalm (66 ) reads ‘the earth has yielded its produce’ as evidence that ‘God, our God, blesses us.’ Such logic is common in the Old Testament, though there are clues (see Job, for example!) that it is more complicated than that. So the way forward, I think, is rather to regard it all as blessing. One of my mentors, who has spent a lifetime as a Christian priest and theologian at the intersection of Jewish, Muslim and Christian thought, is very fond of the phrase alhamdulillah. Whether the news is welcome or unwelcome, God be praised! If we encounter challenges or enjoy success, thanks be to God! It’s all good. Now, we don’t always know how it’s good, but that is a question of a different kind (see Wisdom 8.1 and Romans 8.28).